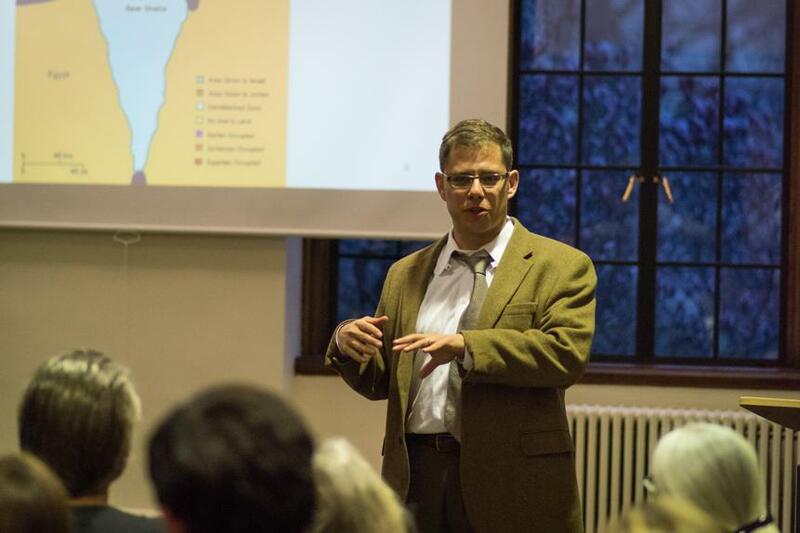 Eugene Kontorovich speaks about the legality of Israeli settlements on Tuesday night. Kontorovich argued that the settlements are technically legal under international law. Tensions ran high in Scott Hall on Tuesday night as Law Prof. Eugene Kontorovich discussed the legality of Israeli settlements under international law. “The word settlement as an international legal term is a bit strange,” Kontorovich said, before explaining its absence from the vocabulary of international law outside the League of Nation’s 1922 Mandate for Palestine. He went on to address arguments that Israeli occupation of Palestinian lands violated the Fourth Geneva Convention from a variety of angles, pointing to Palestine’s lack of legal entitlement to protection from the treaty and Palestine’s questionable status as a sovereign nation. Kontorovich is also a senior fellow at the Kohelet Policy Forum in Jerusalem. Wildcats for Israel, Northwestern’s Political Union and the Alexander Hamilton Society — whose NU chapter Kontorovich helped found — co-sponsored the event. Karna Nangia, co-president of Political Union, said the group brought Kontorovich because of students’ interest in the issue. Kontorovich went on to illustrate ways in which the international community seemed to hold Israel to standards they did not hold for other countries, such as the Vietnamese occupation of Cambodia, or the United States’ own occupation of Western Germany from its creation until 1989. “(It) might be legitimate, but you can’t call it international law,” he said. When Kontorovich opened the floor up to questions, some audience members contested his points. Weinberg senior Josh Boxerman, the outgoing chair for J Street U Northwestern, said he was concerned Kontorovich focused only on the legality of the issue, and said discussion at NU centers too much on people gathering to affirm their own viewpoints rather than engaging in legitimate exchange with each other. “The real questions that we need to be asking about this political situation are political questions,” he said. Kontorovich explained he believes Israel has not violated international law, saying “the most honest answer to 90 percent of international legal questions (is) it’s not clear,” because international law does not have the same legal standards as U.S. law. Wilson Shirley, the head of NU’s chapter of the Alexander Hamilton Society said the event was important in bringing new perspectives to the debate.